Since SpeedSim got many, many features over the years and there was always a lack of some kind of tutorial for them, I'm going to patch this leak. Because you already found this site I think there is no need to tell you what SpeedSim does. 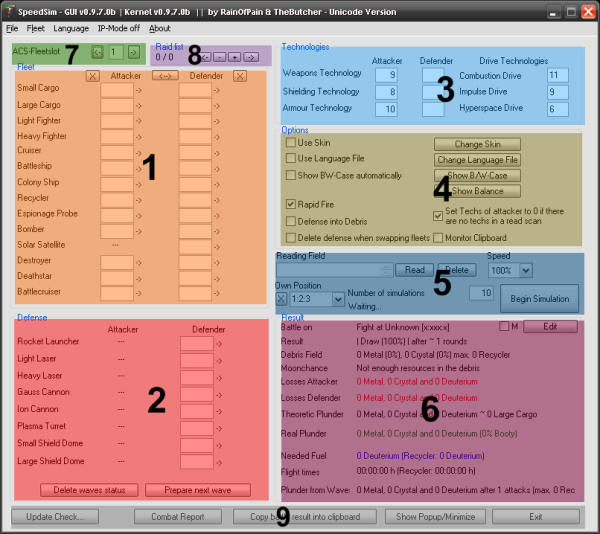 It simulates battles for the well-known browser game OGame and helps planning your raids. This is pretty simple and very self-explaining. Just enter here the attacking and the defending fleet into the input fields. On the right (next to the "->") of every field the average remaining ships will appear. This number is rounded to one digit after the comma. And if no ship of a certain type survived, there will be a 0. The button "<->" swaps the fleets and "X" will delete each fleet and technology. Here the primary target was set to Light Lasers and 1 missile has been sent out. The number in brackets beneath the IP-Missile count is the number of missiles (here 35) you will need to destroy the whole defense (including Anti-Ballistic-Missiles). The Button "Next Wave" takes over the survived defense into the input boxes. Enter here the ship technologies of the attacker and the defender. The drive technologies are those of the attacker (because thats the only one who has to move his fleet to be able to attack). The motor drive techs are also needed to calculate the needed fuel and the flight time. This is the area where you can quickly edit some of the most important options. More options can be accessed in the menu File->Extended Options or by pressing F4. Use/Change Skin: Does what it says: Activates or deactivates skinning. You can find some skins in the download section. Use/Change Language File: Also self-explaining. Download language files from the language files page. Show B/W-Case automatically: Opens the Best/Worst-Case page after each simulation automatically. Show B/W-Case: Opens the Best/Worst-Case page. Rapid Fire: Only deactivate, if your universe has no rapid fire. If you don't know what it means, leave it activated. Defense Into Debris: Also only for special universes. Off by default. 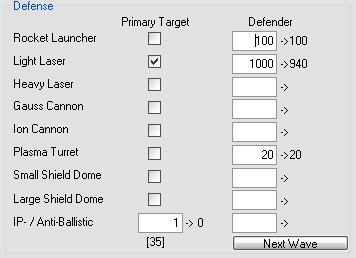 Set Techs of attacker 0 [...]: If SpeedSim can't find any ship techs (shield, armour and weapon tech) and this option is on, all of the attackers ship techs will be set to 0, too. Delete defense, when swapping fleets: Needs no further explanation. Monitor Clipboard: Very helpful option. When activated, SpeedSim will try to read everything copied into the clipboard. So there's no need to copy the text into the reading field. Since the most lines of the resuls section are very clear, only some points will be described. 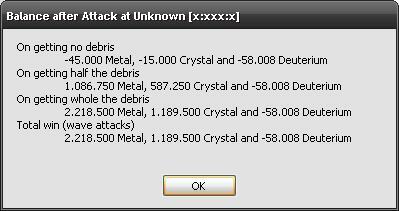 Debris Field: The percent numbers in brackets after Metal and Crystal are your losses of ships gernerally, if you collect only the debris field. Plunder and fuel cost are not included and 100% represent ±0. So, everythin below 100% are losses and if it is above 100% you are making profit from the Debris Field. Debris Field (Recyclers): This is the maximum number of Recyclers you will need to get all resources from the debris. To get the average number, move the mouse over the text field and a tooltip with the average number will appear. Note! The results field will be updated only after a finished simulation. Here you can switch through the ACS-Slots of the combat. You can change them manually by clicking the "->" or "<-" next to the numbers or by pressing Ctrl+Right/Left. 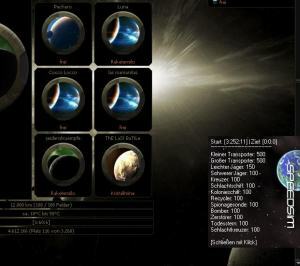 Fleet, Defense, Technologies and Positions will be saved and loaded automatically if you change the slot. The button "Combat Report" opens the last combat report in an new window, like the ogameone. If you click on "Copy battle result into clipboard", you can post it for example in an IRC channel. A great feature is the "Show Popup/Minimize" function. It's not necessary to open SpeedSim - you can see the fleet that you need to destroy the opponent in a small window in the right corner of your desktop. If you click on "Exit", the program will close.